Taking a stroll on Calle Florida isn’t just about shopping. It is an opportunity to check out some interesting architecture, enjoy a tango show, and walk down a pedestrian only road (get a break from Buenos Aires traffic). If you start from the beginning of Calle Florida at Plaza San Martín you will pass the middle class shops and walk just a few blocks to Galerias Pacifico. If you are coming from the south, Plaza de Mayo, then you have long walk where you will pass wall to wall shops before approaching the famous mall, Galerias Pacifico. There are a variety of store fronts, including quality and affordable clothing boutiques, designer fashion, electronics, and tourist shops that are the size of warehouses. This is a street where you can find just about anything you need, electronics, household items, souvenirs, men’s clothing, women’s clothing and sporting good. The most abundant items on Calle Florida are leather purses and jackets. Many of the items don’t include price tags and I’ve heard that they like to double the prices for tourist, so don’t go there looking for a bargain if you’re Spanish is limited to ‘Quanto es’. Even if you are not an avid shopper I suggest a tour along Calle Florida. Its rich history dates back to the sixteenth century, when the city was first founded. It started as a small dirt trail which led to the river, but became the first cobblestone street in Buenos Aires. Calle Florida was paved with cobblestones in the 17th century and named ‘the cobble street”. In the 1880’s the wealthy people, who lived on the southern end of the street, used it to go from the river to their mansions. It wasn’t until the 20th century that the area became commercialized. Now it contains travel agencies, leather goods, crafts, photography stores, fast food, music stores, pharmacies, gyms, jewelry shops, bookstores, beauty salons, and wine shops. One of the highlights of Calle Florida is Galerías Pacífico. A mall located on the northern end of Calle Florida. In 1889, this shopping mall was designed by architect Emilio Agrelo and Roland Le Vacher. When the construction was completed it was named Galería Vittorio Emmanuele II. 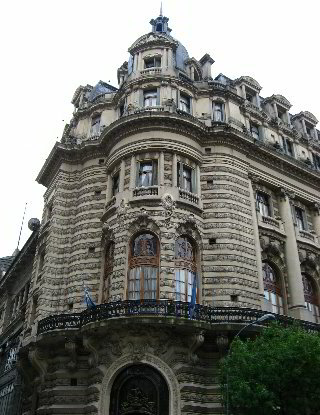 It held a variety of shops and Fine Arts, and it even served as the administrative offices of the Buenos Aires-Pacífico Railway Company in 1908. It wasn’t until the 1940’s that Galerías Pacífico became a shopping mall. It was at that time that many of the beautiful murals and vaulted ceilings were added. The complete look of the three story shopping mall was finalized in 1990 when it was restored to its full glory. There is a list of highlights along Florida Street for those interested in history and architecture. At the beginning of the pedestrian walkway you will find Plaza San Martín which dates back to the early 19th century. At the corner of Plaza San Martín and Florida you will find Riccardi Jewellery store, founded in 1925 and in charge of manufacturing the presidential baton. Next to the jewelers is the Marriot Plaza Hotel, which was built in 1908 to rival the grand hotels of New York. Following Calle Florida south you can’t miss the naked sea god blowing into a seashell; this is Centro Naval, built in the early 1900’s. The next sight to see is Burger King – I know that may seem strange, but you will not find a Burger King like this in the United States. Go inside, head up the staircase and look up at the stained-glass ceilings. Obviously with a street as old as Calle Florida a must see building list could go on forever, so if you are very interest take a tour. Check with the tourist office for guided visits of the area and you will be surprised at what you missed on your first stroll.